“Muzoon’s story of bravery and fortitude inspires us all. We are very proud she will now become an Ambassador for UNICEF and children around the world,” said UNICEF Deputy Executive Director Justin Forsyth. Syrian refugee and education activist Muzoon Almellehan visits a classroom at Yakoua school in Bol, Lake Region, Chad, Friday 21 April 2017. UNICEF photo. • Across the globe, nearly 50 million children have been uprooted – 28 million of them driven from their homes by conflicts not of their making, and millions more migrating in the hope of finding a better, safer life. • Refugee children and adolescents are five times more likely to be out of school than their non-refugee peers. 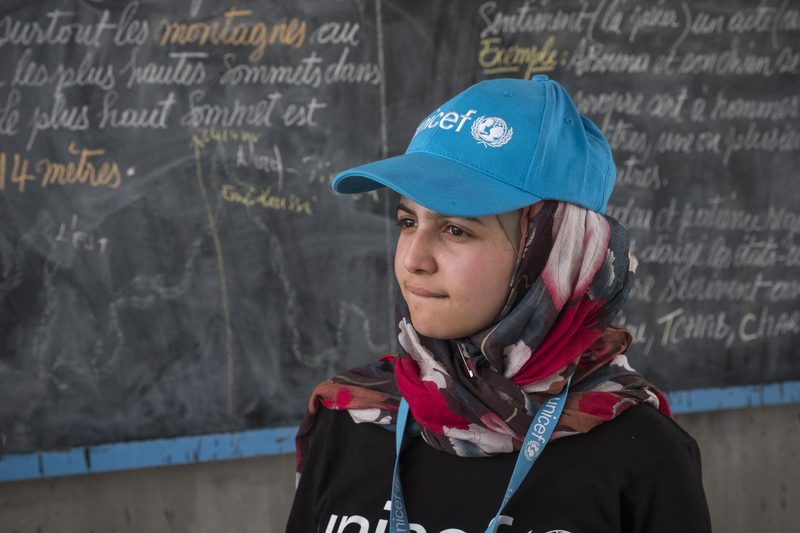 • Girls affected by conflict are 2.5 times more likely to be out of school than boys. • Protracted crises present complex challenges. Refugees spend on average 17 years displaced, almost an entire childhood. • Education in emergencies is severely underfunded. Since 2010, less than 2.7 per cent of humanitarian funding has been spent on education. $8.5 billion USD is needed annually to close this gap.